The INKOMA – Lineflex-coupling is a machine element for the transmission of torque between two axially parallel shafts. Within the specified radial off-set range this transmission, whether dynamic or static, occurs steplessly. Regardless of the degree of radial off-set, speed, and transmitted torque, the velocity from the input to the output does not vary. The INKOMA – Lineflex-coupling can be installed in either horizontal or vertical attitude. Due to the high torsional stiffness and constant velocity characteristic radial oscillations are absorbed. 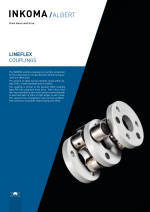 The INKOMA – Lineflex-coupling is dynamically balanced and damps and compensates any radial oscillation. The INKOMA – Lineflex-coupling transmits only the actual torque. No reactive forces are transmitted to supprting bearings. The INKOMA – Lineflex-coupling can operate continously without maintenance. The link sets are equipped with needle and cylindrical roller bearings. For critical cases (backlash-free) the bearings can be preloaded.